We have been busy! 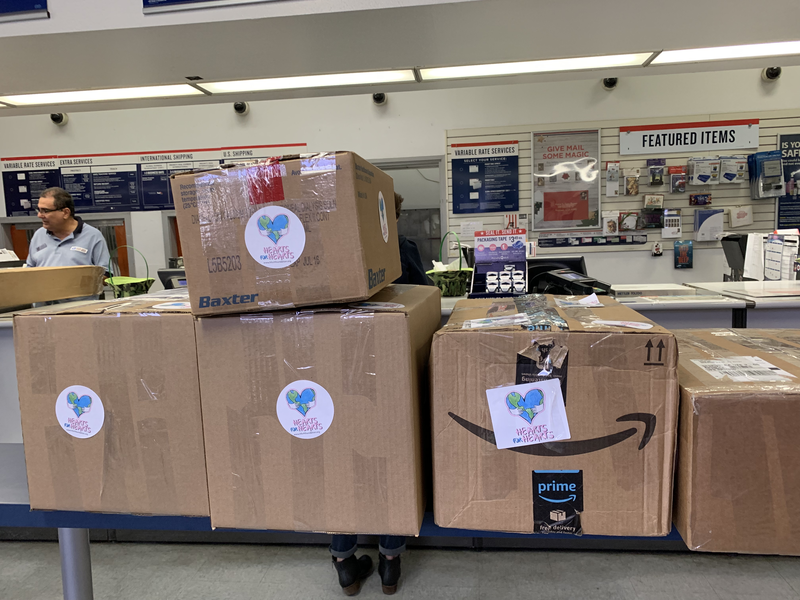 Over the last few weeks, we have shipped nine boxes of supplies to Ghana. 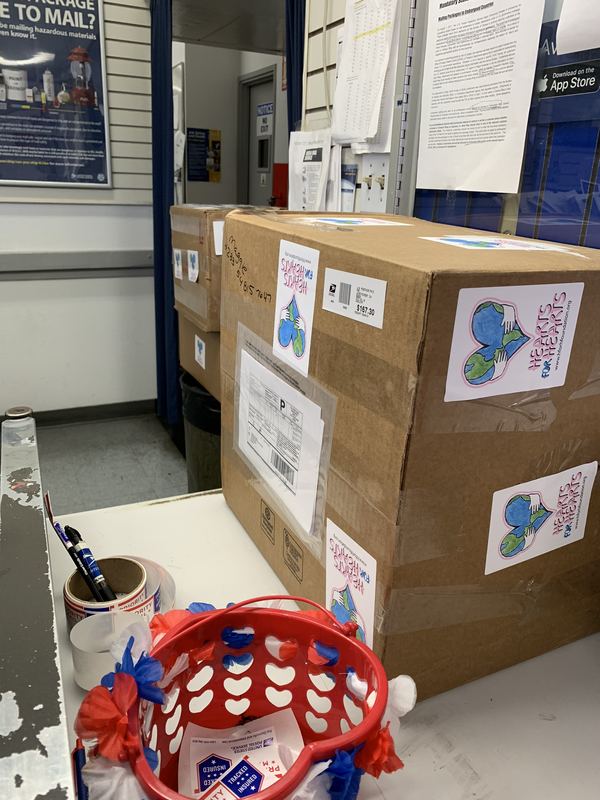 The people at the post office know us pretty well at this point, and I think we have all the kinks worked out to make sure the boxes arrive where they are supposed to. I had not anticipated having to pay additional customs fees once the items are in Ghana to get them released to Maggie. What I mean is that the customs employees do not want to release the boxes until we give them a stipend of some sort. The fee is based on what "they" think the value of the box is so on average it runs about 50 Ghanian cedi or $10. It's not too bad but it adds up quickly and slows down the process of getting the supplies to the people that need them. 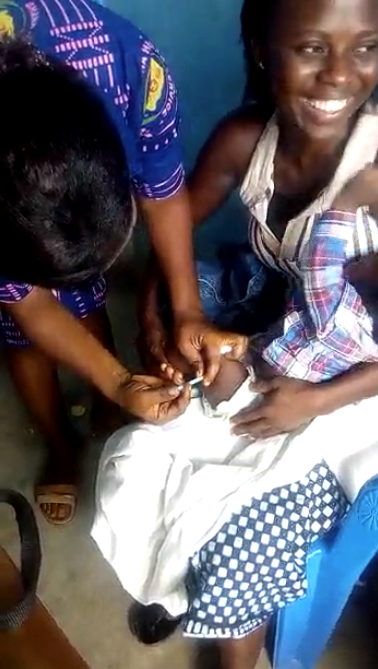 I will be updating the list of items needed to include steri-strips and sutures since the clinic in Ghana requested those. Look for the update in the next couple of days. Hi everyone! I wanted to at least leave a update that I am sorry I haven't given you an update. I have been so busy with college applications and essays that I haven't had a chance to post. Please know that I even though you haven't seen an update here that we are still shipping supplies regularly, almost weekly, to Ghana. 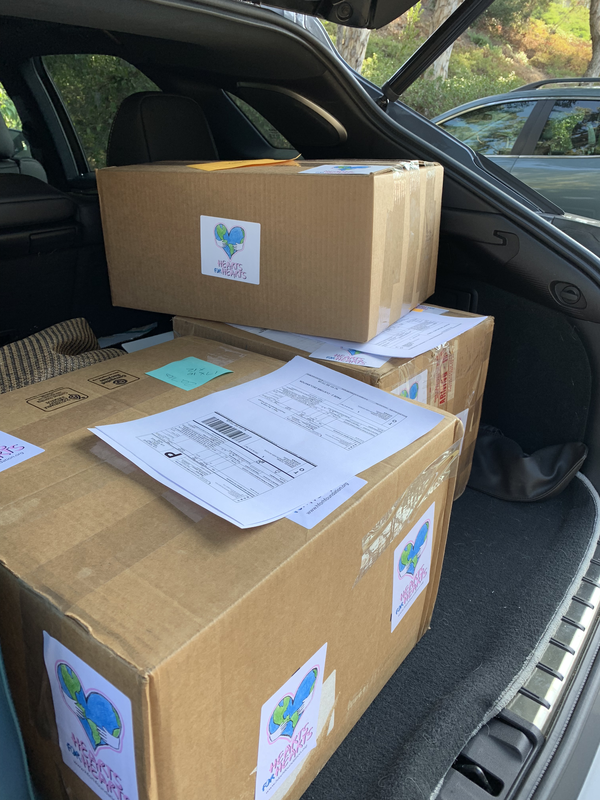 They desperately need blood glucome monitors so we are sending a few more to them. I have two boxes ready to go that I need to take to the post office this weekend. We also have medical supplies to pick up from the supply drive Accurate Background did for us over the past month. We will pick up the supplies next week so I will take some pictures and share them with everyone. ​We shipped another box, a larger box, to Maggie in Ghana and it made it again! I am feeling really good about this because of all the problems we had initially last year. What we are doing differently is sending the supplies to a school and then Maggie can pick them up there. We still have to pay the local taxes so she can get the packages but it's not too expensive, and the foundation is paying for this. We have a reliable process in place to make sure each of the boxes is suitable for a single clinic, hospital, or the leprosy camp. While all the locations need many of the same items, they don’t need equal amounts of gauze, bandages, etc. as the people inflicted with leprosy for instance. Maggie is sending me pictures so I will post them as soon as I receive them. I found out a couple of weeks ago that I was going to be honored with the Points of Light Award. Points of Light is an international non-profit foundation started by President George H. W. Bush while he was in office to recognize youth stepping up to create meaningful change in the world. I was interviewed for the piece they were writing early last week and was just "officially" given the award and the link where the article is posted. I am officially #6336 Point of Light! I certainly did not start this foundation for recognition, but nonetheless I am truly honored. If this helps bring more awareness to the needs of people in developing countries, then it's a success for everyone. You can read the article by clicking the link below. This may not seem like a big deal to most, but it is to my foundation, that the box I shipped to Maggie in Ghana made it! Now we will try a bigger box with even more supplies to see if it makes it. I am going to send her an old laptop too so we can communicate better but this is a HUGE deal!!! Let's hope we can make this happen again!! I'm back!! Hi everyone and thank you for following my posts in my journal and blog while I was gone. Sri Lanka was an incredible experience, and we were able to help a lot of people, but it is hard to compare it to Ghana. 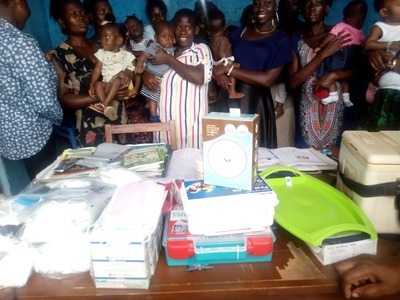 The Horana hospital where I volunteered was very similar to the one I volunteered in the Cape Coast area of Ghana, but the surrounding area was different. Where I stayed in Ghana was in an extremely impoverished area compared to where I was staying in Sri Lanka this summer. The family I stayed with while in Sri Lanka was an incredible family with loving kids that we enjoyed spending time with. They didn't speak English, but that didn't stop us from being able to communicate. In Ghana, I stayed in a makeshift house/shack and took bucket showers, but in Sri Lanka, the house had a shower with only cold water. The first thing I did when I got back was took a very long hot shower. I was able to donate the medical supplies to the hospital where I volunteered and the clinics we set up in the villages further inland from Colombo. 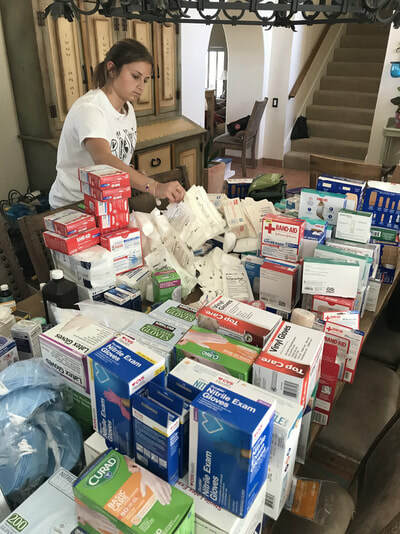 For the last five or six days of the trip, when Aubrey went to Nepal, she was able to hand out first aid kits at the clinics she set up. Altogether it was a success, and we were able to continue the Hearts for Hearts mission to help people in developing countries. Now that I am back I have shipped a "test" package to Maggie in Ghana to see if it gets there OK. I sent it to a school so it has a reliable address to go to with the hopes that will ensure safe delivery. When we went to Ghana last year, we were warned about shipping and items not arriving which is why we carried extra suitcases filled with medical supplies. We shipping items as well but the fees for picking them up were so high that it started to become counterproductive. I'll give an update on this blog when the package arrives. Other than the adjustment to the time zone, I have been swamped getting caught up with life since I got back from Sri Lanka. I had all of my bio homework completed before I left and I annotated the book I needed to while in Sri Lanka so when I returned home, I wouldn't feel like I was in a rush to get everything done for school. I went back to school on last Monday so now I am back to trying to juggle my schedule between school, homework, working at Golden Spoon, college applications AND planning the next area to send medical supplies. 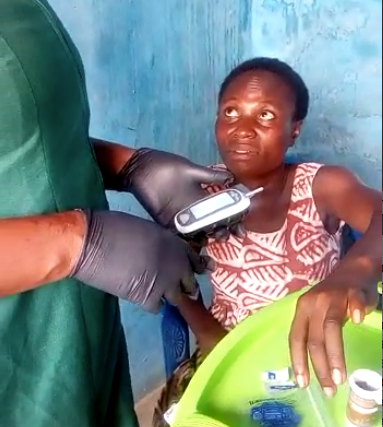 I am thinking about returning to Ghana next summer since they needed really needed the help with the clinics and medical supplies. Since I have been there now, I have a much better idea of how to set things up without having to use a local coordinator. Nana, who was on the trip to Ghana last year, is from Ghana so I have a pretty strong base of people I know and can help me make plans. Mai made it home safely this afternoon, and it's great to have her home. She is super tired by wants to power through it to get back on a regular schedule. Mai had lot's of stories and although she felt good about both the help and supplies the team brought to Sri Lanka, she felt that Ghana needs the help more. She has already made up her mind that she needs to go back to Ghana again. Planning to go back to Ghana will be pretty easy since she has already done it once and has kept in constant contact with the wonderful Coordinator that did so much to help Mai. Now that Mai is back, she plans to ship to Maggi, the Coordinator in Ghana, the rest of the supplies that they needed. We are waiting for shipping everything out until we receive the grant from Western Digital. We had to make a slight change to the non-profit listing with the IRS so large companies can get credit for the donations. Without the help of everyone who donated, this would be very difficult to do. Anyway, Mai will take the blog back over after she gets some sleep. In the meantime, she is safely home. Mai is at the Colombo airport to start her two-day journey home. She will reconnect with Aubrey at the airport who brought some of the medical supplies to Nepal earlier this week. I will update again when she gets to New York tomorrow about 1 PM PST. Mai plans to stay the night at Aubrey's house in Scarsdale tomorrow night and then catch the 6 AM flight to Orange County. Considering she couldn't get coffee in Sri Lanka, I'm pretty sure she will hit up Starbucks as soon as she can. The other thing she said she missed was a hot shower which she will get when they get to Aubrey's house. I'll update to let you know she get's home safely. ​Mai called me last night and gave me a quick update before she started her first day. She said she was really tired when they got to Sri Lanka yesterday because she couldn't really sleep on the plane. Mai said her very first impression of Sri Lanka was it looked a lot like Molokai and from the photos she sent, (left picture above) I agree! As far as the accommodations and the family she is staying with while in Sri Lanka, Mai said they are really nice and the house is nice too. This is very different than what she and the team had in Ghana last summer considering their accommodations were a shack with a roof on top. The Hearts for Hearts team were well aware of the accommodations while volunteering in Ghana ahead of time so the housing in Sri Lanka was a pleasant surprise. Mai said it's kind of strange because the area is very poverty stricken, which she was anticipating, (middle picture above) but there are a couple nicer houses mixed in. The house the four of the girls are staying is one of the the nicer houses and has more than the basics. Don't misunderstand me, she loved the experience of the living arrangements in Ghana, even the bucket showers, and was anticipating roughly the same situation in Sri Lanka. Mai's goal is to one day work for Medecins Sans Frontiers/Doctors Without Borders so she is clearly OK with these types of living arrangements. Thami is the coordinator that Mai worked with over this past year for logistics and she was able to get the team a great place to stay for the three weeks they are there. Mai said the house has running water, only cold, and a fan so it's like a regular house. She said Sri Lanka is what she would think that India is like with streets that have no lights or designated lanes and people driving however they can get by. Todays plan is to go take a look at the Horana Government Hospital and see exactly what they need as far as volunteering and medial supplies. In Sri Lanka there are two types of hospitals, private and government. If you get hurt you definitely don't want to end up in a government hospital because it is not ideal. Even for the insurance we purchased for Mai on this trip ensures she would go to a private hospital if she needed help for some reason. The photo below is of the Horana Government Hospital where they will be tomorrow. I don't have much of an update but what's most important is everyone is in Sri Lanka safely. They arrived about 4 AM PST in Columbo and then traveled to the home they are staying in with host mum Sajani. Mai plans to get a local SIM card tomorrow and will be able to send us real photos. The ones above are from Life360 so we can track her in Sri Lanka and the other is Google Earth. Not ideal but better than nothing. I'll update more tomorrow. Hi everyone, this is Mai's mom filling in for her while she is traveling. Well...she is on her way! Mai flew out last night to meet Aubrey Weinstein at JFK this morning. About 10:30 ET this morning they hopped on the first of two flights to get to Sri Lanka. Mai brought three suitcases filled with first-aid kits and medical supplies and the rest we will ship. 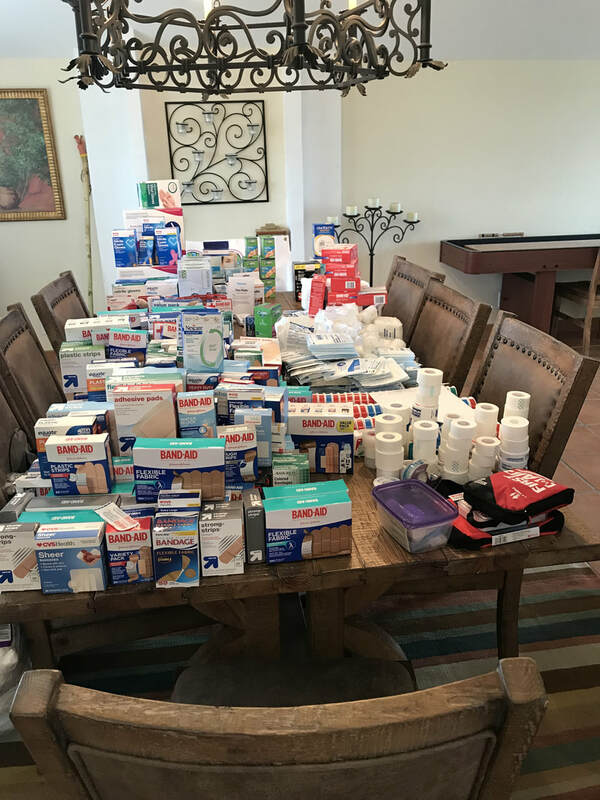 Let's just say we have a dining room filled with wonderful boxes of medical supplies and... we still have a couple more boxes coming. 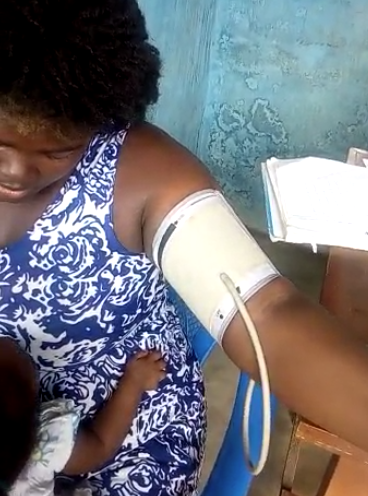 It is such a great problem to have because Mai struggled last year to get enough supplies to satisfy the needs of the Ghanian people. This year, she brought what she could carry as well as shipping items. When Mai returns, at the end of July, she plans to ship boxes of supplies to Maggie, the woman she worked with on the Cape Coast of Ghana. Mai keeps in contact with the people she met so she can continue to ship them the supplies they need throughout the year. 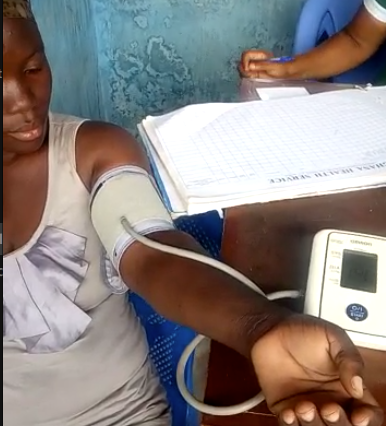 The engineering team at Western Digital donated about 20 blood pressure monitors so the foundation will send ten to Maggie in Ghana and the rest to Sri Lanka. She brought a couple with her on this trip but wants to asses the needs of the area closer before she sends them eight more. I have to say, as Mai's mom, I am pretty darn proud of her. I don't know how she does everything she does while keeping straight A's, working at Golden Spoon and spending time with friends. Tomorrow's plan is Mai will spend the day with the local coordinator she is working with to go over the details for the next three weeks. She wants to make the most of her time in Sri Lanka, and both dispense the supplies/kits as well as volunteer. Mai planned things a little differently on this trip with the supplies and made it easier to only bring what she knows is needed in specific areas. I will do my best to update this daily while Mai is gone. Thank You Western Digital and Cindy Grace, Jocelyn Kuno, Ky Begley, and the engineering team. ​Today was the big Western Digital volunteer event, and they supplied us with people to help and medical supplies. I had a pretty good idea of how it would go today but I underestimated the willingness to help that the volunteers demonstrated. We filled the SUV with enough medical supplies to make roughly 300 first aid kits. We didn't want to overwhelm the volunteers so we brought what we thought was "just enough." We weren't sure how many medical supplies the Western Digital volunteers had donated, but we would see what was there once we arrived at their Irvine office. The volunteers had donated a lot of supplies that we could use right away and they also had some of the supplies that are needed in Ghana. Twenty blood pressure monitors and four blood glucose monitors with the test strips!!! 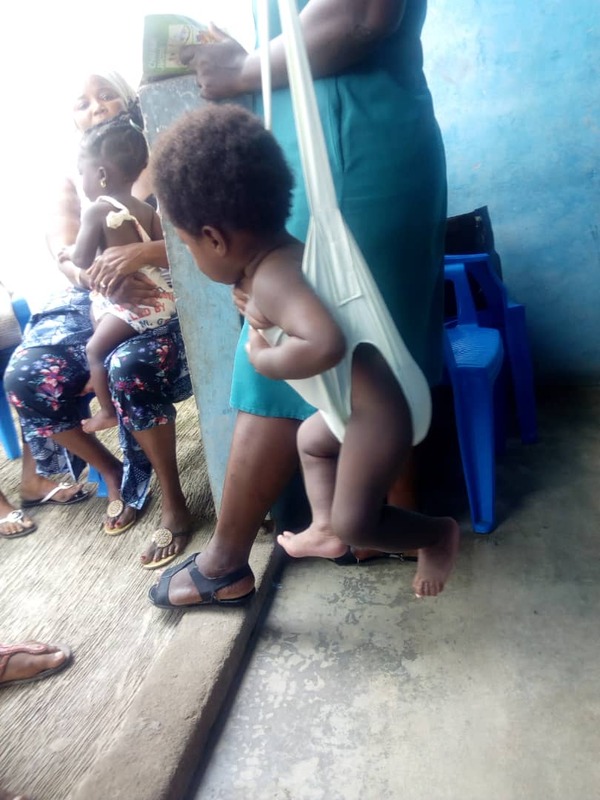 This may not seem like a lot but this is more than the entire hospital had in Cape Coast, Ghana. I can't express how much I appreciate everything today and how grateful I am. 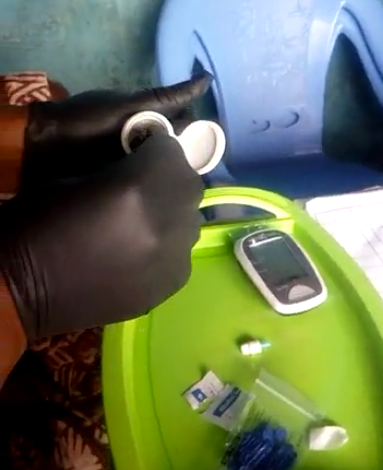 These items are in high demand in underdeveloped areas because they simply don't have the funds to get them. In addition, Western Digital gave Hearts for Hearts Foundation a very sizable grant to get these supplies to where they are needed. Thank you! Thank you! Thank you! Today has been both rewarding and exhausting. 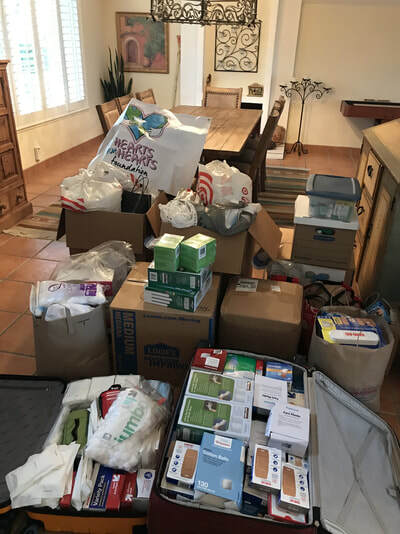 We are sorting and organizing the donations that we received from Santa Margarita Catholic High School, St. John's Episcopal School, Orange Theory RSM, and Riverside High School. And this is before the donations from Western Digital which we will collect this Thursday and make first aid and hygiene kits. They are also supplying us with 25 volunteers to help make the kits and then package it up for shipping. Project C.U.R.E. is also donating Kits for Kids which are first aid kits for children and Medline is donating a variety of medical supplies. We have received so many medical supplies this year, I am incredibly grateful to all the people that have supported my foundation. I will post pics after the Western Digital event on Thursday. Admittedly, I am feeling a bit of anxiety with the amount of homework I have that will be due when school starts in mid- August. Tomorrow will be a full day of focussing on essays and biology. I have the details of my homestay family, and what the living arrangments are for the three weeks I am there. The home I am staying in is approximately 2 km from the Horana Government Hospital and about 26 miles from Columbo. For those who are unfamiliar, Columbo is the major city in the Western Province. There are two types of hospitals in Sri Lanka, government Hospitals and private. As you might imagine, the private hospitals are the more advanced hospitals that you would prefer to go if you are ever there and have an urgent need. Our coordinator, Thami (pronounced Tommy), has been great with helping to make sure everything is in order before we leave the US and once we arrive in Sri Lanka. I don't think I could do this without the help of someone locally in the locations. Thami has arranged for us to be picked up at the airport, taken to our homestay and orientation of sorts to make sure we have a solid understanding of the local culture. On day two we will spend it at the government hospital for training on how they suggest we treat different ailments we will come across in the orphanages and local clinics that we are setting up. The good news is the living arrangements in the homestay are seemingly better than Ghana last summer. I didn't mind the living arrangements in Ghana at all, in fact, I loved it. It was so different and minimal, yet it worked. Obviously, bucket showers are not ideal, however it didn't stop us from being able to help so many people. Back to the homestay. The family we are staying with have two children, and the mum is a housewife. Their son is seven and daughter is four so it will be nice to see how a typical Sri Lankan family live. For those of you who remember the story from Ghana, there was a little girl in the house I was staying in who kept stealing my toothbrush. This time I will bring a few extras with me just in case! The area where I am staying is a bit more populated, so I can walk to the pharmacy if I need another one. Fortunately, I don't need to get additional vaccines this time since I did the two-year vaccine for typhoid fever and there is little risk of malaria in Sri Lanka. The most significant prep is going to be organizing the medical supplies over the next week. We are in the final two weeks of getting everything together for the trip to Sri Lanka. We have had a few hiccups but nothing that isn't surmountable. The biggest challenge is when we initially registered with the IRS in 2016 we were classified as a "Private Foundation." We never thought anything of it, but that meant we couldn't get donations and grants from large corporations. Upon registering with Benevity for grants they pointed out the problem, so we are making the quick changes with the IRS. The woman at the IRS was really helpful and she said this happens all the time and it isn't a problem to change at all. Filled out a few forms and sending them FedEx today. Thank goodness! Western Digital - ​The supply drive is scheduled, and the volunteers are ready to help pack everything up on June 28th. I am working on getting boxes donated, but I already have the rest of the packing materials needed to make mini first-aid kits. 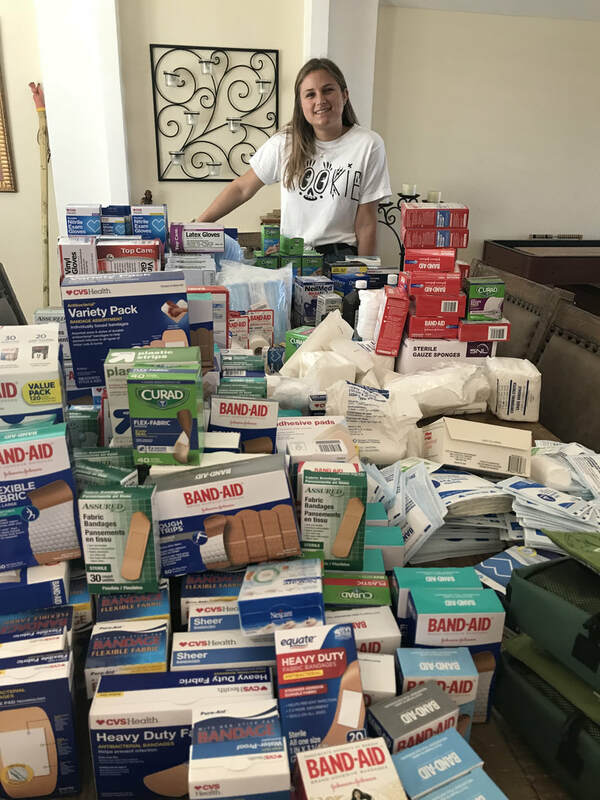 Devin Hinson & Riverside High School - Devin is bringing out the supplies from the drive she held at Riverside High School in the spring. She arrives tomorrow, so I am both excited to see her and appreciative for all of her hard work for Hearts for Hearts. Medline - They have partnered with Project C.U.R.E. to help manage their medical supplies when donating them to non-profits. They have mini first aid kits that will be donated and shipped to us before we leave on July 6th. ​Orange Theory Ranch Santa Margarita - The supplies have piled up and one of our volunteers will pick them up today to sort through over the weekend. St. John's Episcopal School - They collected a full carload of medical supplies for the foundation. I love the St. John's community because they teach the students from kindergarten on to give back to others. I was at SJES for eight years, and we were always doing something to help others whether it was water for Honduras, Joy Jars, donations for Marines coming home and more. They instilled in me the value of caring for others. I am overwhelmed with gratitude for the help and donations we are receiving to send medical supplies and hygiene kits Sri Lanka next month. Western Digital has awarded the Hearts for Hearts Foundation with a grant to help ship the medical supplies. Not only are they paying for shipping but they are also providing us with medical supplies and volunteers. 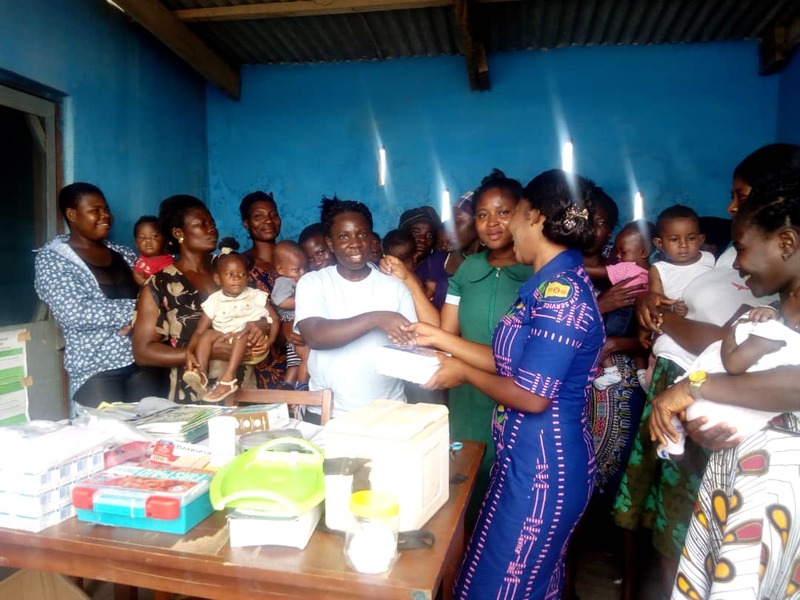 This is a really big deal for a small non-profit like us, and their contribution will enable us to both bring medical supplies with us next month but also ship more supplies to Ghana, Nigeria, and other developing countries. Western Digital is holding a supply drive June 18-22 collecting the items needed. 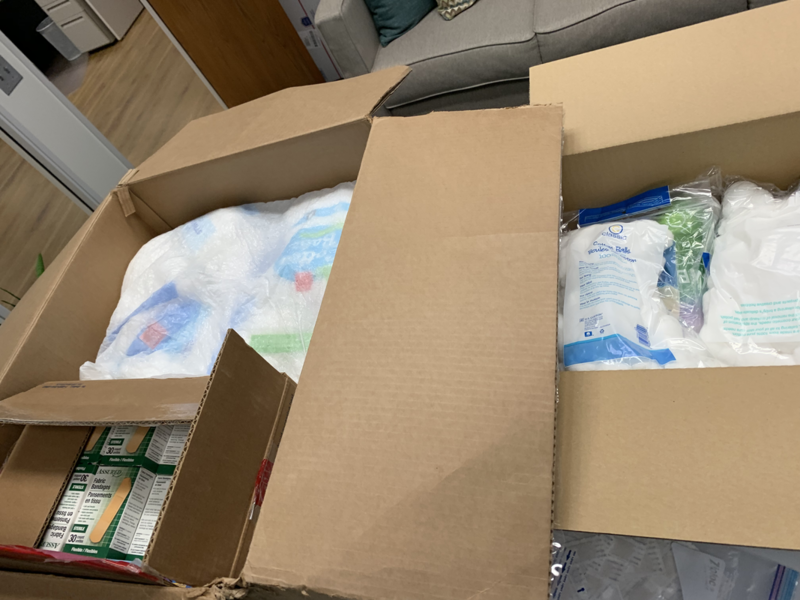 About a week later, on June 28th, they are coordinating employee volunteers to organize and box the supplies so we can ship them out. For whatever supplies I cannot afford to ship, I plan on packing in suitcases and checking them at the airport on my way to Sri Lanka next month. Fortunately, Team Leader Aubrey Weinstein is flying from New York to LA to help pack the supplies we will have to carry on the plane. We figured this made the most sense so we could get the airline to let us take more bags. The rest of our amazing volunteers are coming from other countries and we will meet at the airport when we all land in Columbo. We had to do this last year as well and it worked so we will try again. The main difference is that last year we flew Delta to Ghana and this year we are flying Qatar Airways. Wish us luck! 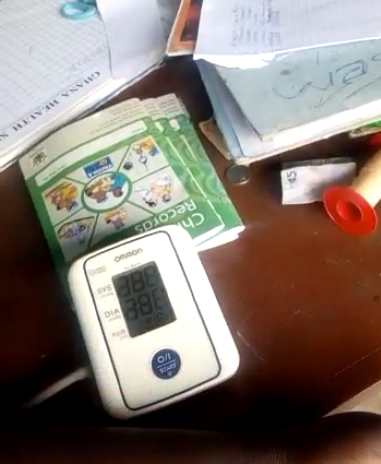 The medical supplies are starting to add up!! Orange Theory Fitness in RSM is a donation location and is accepting medical supply donations until June 15th. The annual Camp Pendleton Mud Run to support the Marines is coming up this weekend. With the help of the Jones family, we have set up a Hearts for Hearts Team for the event. We are running the 10K and obstacle course event on June 9th which will be both fun and equally exhausting. If you are interested in joining us, we are scheduled for the 11:30 AM slot you can still register for the 9 AM time slot We will try to take pictures but I am not sure how considering we will be getting pretty muddy. Thank goodness I took a photo for this blog and I will every time I ship supplies for now on. We received an email from Malcolm Asher of ArtPass International that our contact in Nigeria never received the shipment we sent last month. I have been busy studying for the AP finals so I hadn't checked the tracking to see where the package was. When we looked this morning we found it still here in the US stuck in customs. Malcolm confirmed with Godwin that the address was correct, but for some reason, it was stalled. I knew we did the customs paperwork correctly because we even had the agent confirm everything was correct. So when we filed a claim today, there was a place to add a photo or file to help them locate the shipment...so I did. Thank you to Haley and everyone at Orange Theory Fitness in Rancho Santa Margarita for hosting a medical supply drive for Hearts for Hearts. The supply drive will go until June 15. I am so grateful for all the support we are receiving. If you are interested in donating supplies you can drop them off everyday until June 15th at 8 PM. 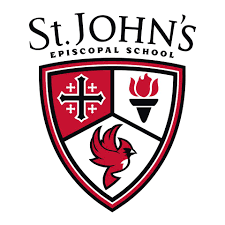 I received great news this afternoon from St. John's Episcopal School that they will host a supply drive for the foundation! I am beyond thrilled because it was while I was attending St. John's that the tsunami hit Sri Lanka and we started collecting donations to help the children that were orphaned. I was very young, but the number of people that were misplaced and lost family really affected our school community. Mr. Lusby, Father John, and Miss Patti decided at that point that we needed to make Sri Lanka our Community Service Project and we learned about compassion and the need of helping others. This was my motivation to bring medical supplies to the underdeveloped areas in Sri Lanka this summer because they poorest areas are still in need of basic medical supplies. I also received confirmation that Western Digital is hosting a medical supply drive for Hearts for Hearts too! 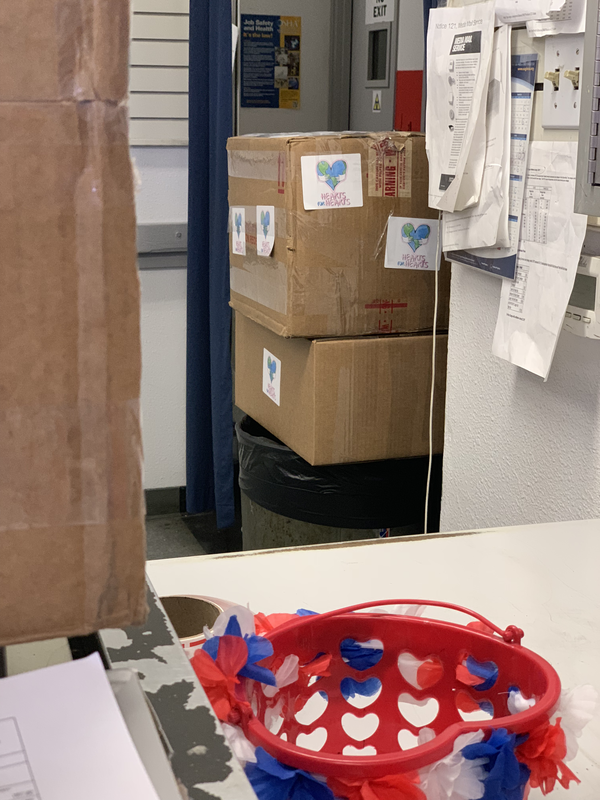 The Irvine location has approximately 1,500 employees that will participate in donating as well as helping package everything up to be shipped out. I am so grateful that everything is coming together so well! I leave in just under two months, and there is still so much to do. I'm proud of my community and all the support they have provided. They are helping so many people with items that seems trivial to most.